The city of Bryre suffers under the magic of an evil wizard. Because of his curse, girls sicken and disappear without a trace, and Bryre's inhabitants live in fear. No one is allowed outside after dark. And what he knows will change Kym's life. Click here for sample on HarperCollins' website. Would you like a signed copy of Monstrous? Now you can order them through the fabulous Porter Square Books here. Simply put "signed copy" and the name to make it out to in the order comments and I'll sign your book before it's shipped to you! "Once I started reading, I could hardly do anything else--the elegant writing, vividly imagined world, and Kymera's marvelous strength kept me hooked. Brave, refreshing, and entirely enchanting, Monstrous is a book that will stand the tests of time." "While Kymera’s journey reads like a timeless fairy tale, my favorite thing about her is that she’s not waiting to be rescued. She is the rescuer. She’s tough, vibrant, intelligent and brave enough to be vulnerable. This is a dazzling and unique once-upon-a-time about a girl who is part dragon, part bird, part cat, all hero." "Magic, fantastic creatures, mythology, & a bit of Mary Shelley’s Frankenstein combine here for an exciting…tale." "Like a literary mad scientist, MarcyKate Connolly takes bits from classic fairy tales and legends and uses them to assemble a creation that is wholly original and wonderfully strange. Subversive, bewitching, and whip-smart, Monstrous is a marvel of storytelling alchemy." "Frankenstein meets Coraline in this creepy tale. Kymera, reborn of animal parts and a human brain, knows nothing except that she loves her father, who has built her for a mysterious, disturbing purpose. Though Kymera's guileless narration ensures that readers always suspect more than she does, Connolly's technique effectively builds a sense of dread, as does her skillful interweaving of fairy-tale elements." "From its first line, Monstrous had me in its grip. MarcyKate Connolly has created a fresh and wildly inventive dark fairy tale about Kym, a protagonist as sweet as she is strong. Kym's bravery shines, as she fights against the menacing forces in Bryre and also struggles to figure out where she, a self-described monster of a girl, belongs. This remarkable, absorbing debut will enchant readers." 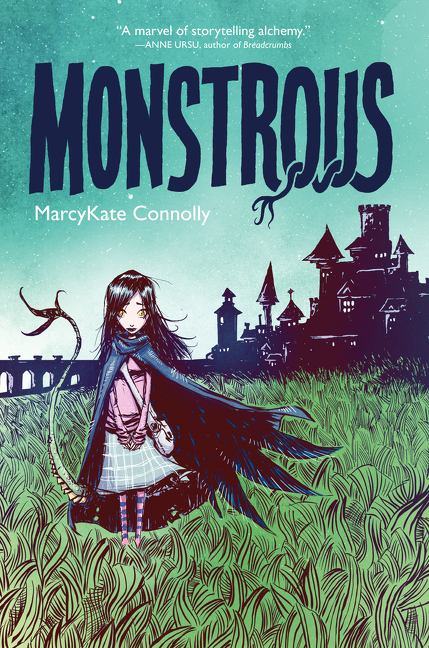 "A likely read-aloud that has its share of guts, blood, and grim reality within this fantasy land, Monstrous will keep young readers thinking about trust, good and evil, friendship and loyalty, and devotion to community." "Pays tribute to classic fairy tales while turning the tradition on its head. A smart, ambitious adventure, led by a heroine whose differences only enhance her humanity." "Readers seeking a lengthy, thoughtful novel, particularly those who appreciate careful world-building, will find this worth their time." A Common Core aligned Discussion Guide for Monstrous is now available!